I have the hots for you. You're welcome, Rita. Loved your caption. This week I LOVE, "I have the hots for you." So perfect! Ooooooo, I love that caption, Sherry. This is such a fun image. I really, really LOVE, "A match made in heaven." Fantastic caption, Jana! The light of my love. Both are fabulous captions, Mary. I still love your captions from last week as well. I had a hard time choosing a winner. Thanks for joining WW today, Jeanette. Great caption! Don't forget to leave your email. You light me on fire. Hi Anne! Glad you joined us for WW again. Great to have you back. Love your caption! Is it getting hot in here or is it just you? Match dot com really worked for me, our match is perfect! And in just a few months there'll be another match to worry about... A little one. 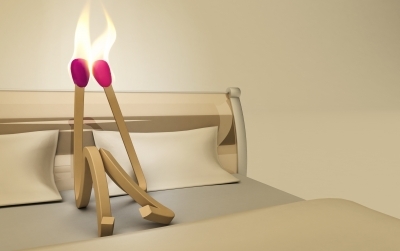 And that's how matches are born/made. End of story. I was waiting for someone to say, "Come on baby, light my fire." Wonderful captions, Tabitha. I can totally relate to the hot flashes!!! I think my fave of your captions this week is, "Red hot romance." But they're all good. Nice job, BN! Honey, he doesn't hold a candle compared to you. Haha. Great one, Laura. I love it. Very clever. Congrats, Rita! I love all of these answers! I'll just go with Come on Baby Light My Fire! Christy's song caption strikes again! But it goes with the image perfectly, right? I love it. Tell me this is not just a flash in the pan! Ooooo, very creative, Karen. Love, love, love it! Thanks for joining us for WW, Donna! Love your caption. And thanks so much for remembering to leave your email.